Elijah was at one of lowest points in his life. He’d been on the mountaintop of victory and suddenly in a matter of days he “crashed and burned” in the valley of defeat. Yet in spite of his dilemma God had other plans which did not include remaining where he was. The LORD was not in the wind, earthquake, or fire… “Finally, there was a gentle breeze…” God first got Elijah’s attention making his presence known then God talked with Elijah. Today we know “my servant” as Jesus. There is “one thread” running through Jesus’ story as recorded by Matthew, Mark, Luke, and John. 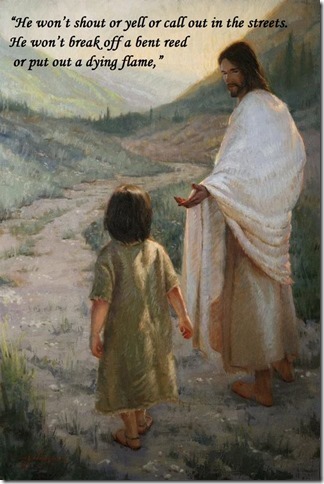 Jesus is always at the right place at the right time touching people with the gentleness of a loving Father. The day will come when Isaiah’s words, “He won’t shout or yell or call out in the streets. He won’t break off a bent reed or put out a dying flame,” will no longer apply to Jesus but until then we need to continue putting our trust and faith in them. “Be still, and know that I am God!” (Psalm 46:10, NLT) What “crash and burn” scenario is God using to get your attention?